We’re getting young people involved! A vehicle for young people to become involved in the Community through leadership. In an effort to engage youth in the community, the Young Ambassadors program was created to build awareness among teens of the Malibu Foundation and the programs it supports in the community. Through participation in this program, young people learn leadership skills, how a nonprofit organization works, and how to develop, promote, and implement their ideas. We would like to recognize Isabella Soderqvist for her compassion and leadership, and for inspiring us to start this Youth Ambassadors Program. Isabella started the free clothing store called "Izzy's Donation Center" right after the fires in order to service those most in need. She also sold hats to raise money for the Malibu Foundation. As a member of the student council, she started the “No child sits alone at lunch” program. She also befriends children coming to this country for surgeries performed by Mending Kids International and started a GoFundMe site to replace laptops for child and teen fire victims. Izzy says she wants to help other kids because she believes in family and friends. Congratulations on your Dolphin Award from the Malibu Times, Izzy! Through our expanded services, we are working with the Law School at Pepperdine to provide legal services to individuals and families who are working through challenging obstacles caused by the Woolsey Fire. Many people are struggling with issues related to insurance, applying for aid and assistance, dealing with rebuilding permits, and other matters where legal guidance would go a long way. We're excited about the potential impact this program will have in setting people up for success moving forward. As the rebuilding process begins, some people continue to struggle to get their feet back on solid ground. We have been receiving messages from the community that many people who once lived in homes are now sleeping in their cars. We all know of at least one among us. Hearing that, we sprang into action to help out our neighbors. Our partnership with Upward Bound House of Santa Monica has allowed us to supplement the help we are providing to those who need it most. We now have a dedicated staff helping us with the situationally homeless. Upward Bound House provides homeless families with housing and supportive services to suit their specific needs. Their programs are designed to empower homeless parents and their children to obtain housing stability, build healthy relationships, and enjoy emotional and financial well-being. A team of professional staff offers an array of services in housing, employment and evidence-based, trauma-informed care to over 200 families annually. We are excited for this partnership and know that through our integrated and wholistic approach with all of our other partner programs, nobody should be falling through the cracks. We are working with Mountains Restoration Trust to restore our beloved Santa Monica mountains by rebuilding the greenhouse & nursery lost to the fires. This will be a community greenhouse that will serve as an educational building for K-12. We are creating our community based programs in conjunction with MRT to service the Woolsey affected areas including rebuild, replanting and teaching. Stay tuned! 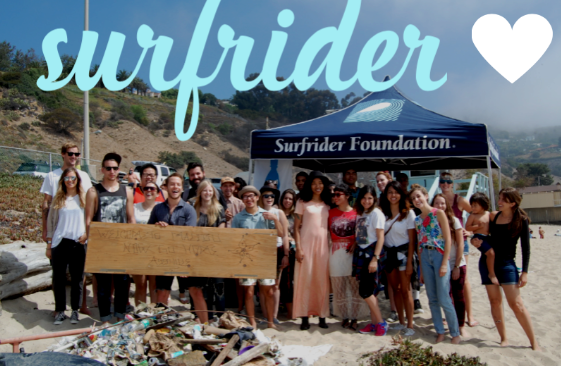 We are excited to announce a $5,000 grant that we are giving to Surfrider Foundation. They are an incredible organization that is NOT ONLY helping to keep California's oceans clean by putting together volunteer clean-up events, recycling collected cigarette butts. and more, .. but they were instrumental in getting food, supplies and water to fire victims during the peak of the fires. California has a lot of cleanup work to do after the fire, and Surfrider Foundation knows how to make an impact, advocate for a more sustainable community and provide a cleaner ocean for all of us to enjoy. Thank you Surfrider for all that you do! We are giving $10,000 to United in Harmony so they can continue their programming to support homeless and poverty-facing children. Camp Harmony is held at Camp Hess Kramer in Malibu, which had 90% of the facility burned down in the Woolsey Fire and will not be available for use this summer. In addition to losing their facility, Camp Harmony has lost 100% of their programming and sports supplies along with all of their other equipment that was stored at Camp Hess Kramer in storage containers. United in Harmony's overnight-camp is designed to help homeless and foster children develop positive self-esteem and provide them with a break from the tension of their daily lives. More than 600 children attend each year and grow through interactions with teenage and adult role models while experiencing nature, exploring arts, sports, and an array of other enriching activities. Our grant will help them recover their lost supplies and rebuild the facilities where Camp Harmony is held. The work they do is incredible, so we want to make sure they are able to get back to it as soon as possible. This grant will make that happen. On April 4th, designer John Varvatos is holding a fundraiser event with 10% of the proceeds going to Malibu Foundation. Donors will have a personalized shopping experience as the are introduced to the new Spring collection. We're really happy and grateful for this opportunity. On April 6th, Calamigos Guest Ranch is hosting an event dedicated to the Malibu Community. They are inviting musicians who were affected by the fires to play for guests of the event. The proceeds we raise through this event will be granted to eligible Malibu artists of all mediums who have lost their tools, portfolios, workspaces, and homes, and are struggling as a result of the fire. We are incredibly grateful to Vanessa Garcia, a local artist who is using her talent to raise money for the Malibu Foundation to benefit our community of artists and creative professionals. Her work will be featured at the event.